Flashpoint Sports was established first and foremost to manufacture modular climbing holds and to produce artificial rock climbing walls for indoor and outdoor facilities. Flashpoint Sports is Australian owned and operated and all products are made in Australia. Recent developments by Flashpoint Sports have pushed the standard and the expectations of the climbing public to a new level. This has been achieved by the introduction of an Australian designed and manufactured fibreglass rock climbing wall system named Fibre Rock. It is limited only by your imagination. Subsequently, Flashpoint Sports has moved to the forefront of design, manufacture, climbability, aesthetics and durability, whilst maintaining the highest possible safety standards employed today. With over 14 years of experience Flashpoint Sports will deliver the ultimate climbing experience. To date we have produced more square metres of rock climbing wall than any other manufacturer in Australia and we are the leading designers and builders of commercial rock climbing walls and fibreglass rock climbing walls. Our rock climbing hand holds have been around since1991. We have supplied to all manner of facilities, from pre-school playgrounds to television productions, and on many occasions we have customised holds for specific applications. We supply rock climbing hand holds all over Australia and over seas and continue to develop our client base throughout the world. Our range of rock climbing holds is continuously evolving and changing as the complexities of indoor climbing facilities increases and as the requirements for training and indoor/outdoor use develops. ‘Climbers Edge’ – Traralgon, Vic 550 sq.m. ‘Y-Rock’ – Bendigo, Vic 250 sq.m. ‘Cairns Climbing Gym’, Qld 1500 sq.m. ‘Mt Beauty Indoor Climbing Centre’, Vic 270 sq.m. ‘The Mill’ – Melbourne, Vic – 900sq.m. ‘Rocky Climbing Centre’ – Rockhampton, Qld – 450sq.m. Stawell Leisure Centre, Vic– 40sq.m. 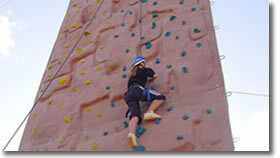 ‘Cowes Indoor Climbing Centre’, Vic – 300 sq.m. Christ Church Grammar School, W.A. – 26sq.m. Shepparton High School, Vic – 50sq.m. Daylesford High School, Vic – 50sq.m. Warrnambool High School, Vic – 35sq.m. Gisborne Secondary College, Vic - 45sq.m. Frankston Secondary College, Vic – 30sq.m. Warrnambool High School, Vic– extension – 20sq.m. St.Brendons College – QLD – 50sq.m. Ballarat Clarendon College, Vic – 54sq.m. Mackay North State High School – QLD – 60sq.m. FibreRock. Sport and Fitness Expo, Vic – Boulder – 55sq.m. Rans Management Group, Vic – Mobile bouldering wall – 35sq.m. ‘Gladiators’ Climbing walls x2, Qld – 7 Television Network – Safety Consultant. Private residence – Melbourne, v – 35sq.m. Bendigo Gym Centre, Vic– bouldering wall –12sq.m. Private residence, NSW – bouldering wall – 50sq.m. FibreRock. Police Youth Camp, SA – Tower - height 7m – FibreRock. Mobile climbing wall, NSW – Tower - height 8m – 50sq.m. FibreRock. ‘The Big Breakfast’, NSW – 7 Television Network – 40sq.m. FibreRock. Private Residence – NSW – 35sq.m. (extension – 10sq.m.) FibreRock. Billabong Ranch, Vic– bouldering wall – 80 sq.m. Outdoor Adventure Skills, SA – Tower – height 9m – 40sq.m. FibreRock.